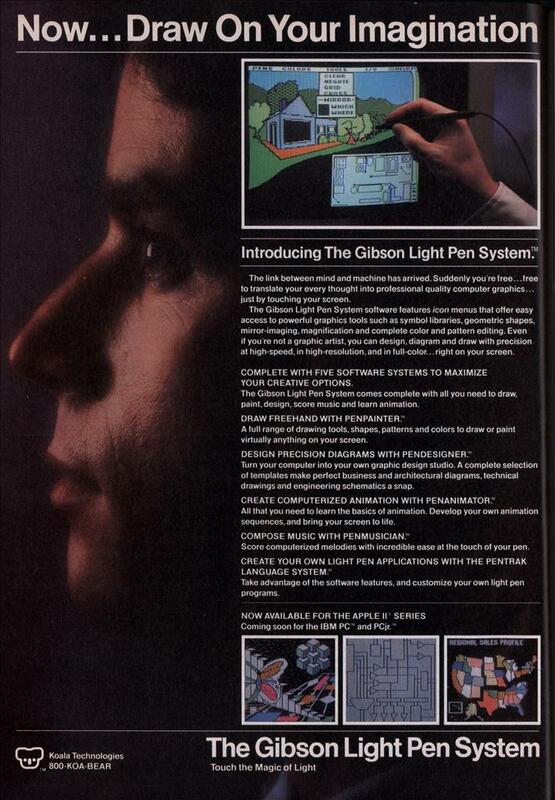 Introducing The Gibson Light Pen System. The link between mind and machine has arrived. Suddenly you’re free.. .free to translate your every thought into professional quality computer graphics… just by touching your screen. The Gibson Light Pen System software features icon menus that offer easy access to powerful graphics tools such as symbol libraries, geometric shapes, mirror-imaging, magnification and complete color and pattern editing. Even if you re not a graphic artist, you can design, diagram and draw with precision at high-speed, in high-resolution, and in full-color… right on your screen. COMPLETE WITH FIVE SOFTWARE SYSTEMS TO MAXIMIZE YOUR CREATIVE OPTIONS. The Gibson Light Pen System comes complete with all you need to draw, paint, design, score music and learn animation. A full range of drawing tools, shapes, patterns and colors to draw or paint virtually anything on your screen. DESIGN PRECISION DIAGRAMS WITH PENDESIGNER. Turn your computer into your own graphic design studio. A complete selection of templates make perfect business and architectural diagrams, technical drawings and engineering schematics a snap. CREATE COMPUTERIZED ANIMATION WITH PENANIMATOR. All that you need to learn the basics of animation. Develop your own animation sequences, and bring your screen to life. Score computerized melodies with incredible ease at the touch of your pen. CREATE YOUR OWN LIGHT PEN APPLICATIONS WITH THE PENTRAK LANGUAGE SYSTEM: Take advantage of the software features, and customize your own light pen programs. Koala Technologies, are they the same people who made the Koala pad? I had one of those. The light-pen is a great example of modern computing. When it was invented, they figured out it was a bad idea, as holding out your arm for long amounts of time is very unpleasant…. yet it keeps re-invented every couple of years. Lightpens / lightguns had some very valid uses that trackballs (the mice of the day) didn’t suit. Air traffic control, for example: they work well for pointing out a screen object for ‘tagging’, etc. I had a light pen on my C64, which is probably how I got my start in digital art. These days I use a Wacom tablet instead. Sometimes I think about getting a Cintiq to go full-circle, but the Wacom is fine for me. Is that Carl Sagan, or did they just choose a model who resembled him? Toronto: Mice were definitely around in 1984. 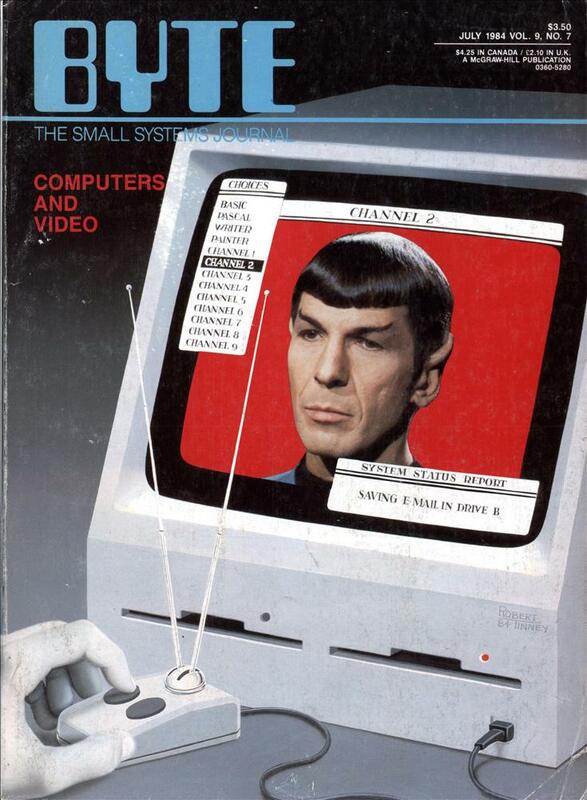 I encountered mouse devices (though they were far too expensive for home use) in the seventies. GaryM – yes, but light guns on radar sets were around much, much earlier.